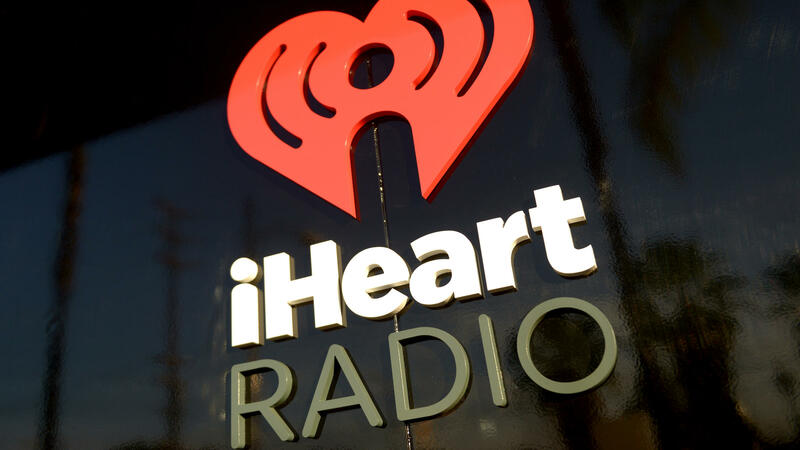 iHeartRadio logo is seen during at the iHeartRadio Theater Los Angeles on May 16, 2014 in Burbank, Calif. The company writes in a press release that it has reached "an agreement in principle with holders of more than $10 billion of its outstanding debt and its financial sponsors" that will essentially cut its debt in half, and that it has filed motions with the court to be allowed to operate normally through the restructuring. The bankruptcy follows, by two months, the bankruptcy of the country's second-largest radio company, Cumulus, which offloaded $1 billion in debt. Per the terms of its filing, the company will distribute 94 percent of its "reorganized common stock" after the upcoming restructuring, and issued $5.41 billion in new secured debt to its senior debt holders. As well, those debt holders will receive all of the equity it holds in its dominant outdoor advertising company, Clear Channel Outdoor Holdings (CCOH), which will be distributed to the same debt holders. Asked to clarify who would be receiving these equities, iHeartMedia declined to comment and referred NPR to the language of the filing. In 2017, for example, in order to put off having to pay some $476.4 million in debt securities it would have owed in 2018, the company exchanged that debt for the same amount, at a higher interest rate, due in 2021. It also did the opposite, exchanging debt securities due in 2021 for that year in exchange for a lower interest rate — however, many of the debts it exchanged this way last year were significantly lower than the debts it chose to delay; $15.6 million and $45 million in two transactions, for example. In 2016, the company sold a subsidiary, Broader Media, $383 million of iHeartMedia's debt at a price of $222.2 million, relieving itself of $156.7 million and saving it $38.3 million in interest. About 10 years ago, the amount paid for iHeartMedia, Inc. — $26.7 billion — was a particularly lofty example of a "leveraged buyout"; broadly, the term for purchasing a company by borrowing the money from banks, which issue those loans against the company's cash and assets. The buyout was led by Bain Capital, the private equity firm founded by Mitt Romney in 1984, and Thomas H. Lee Partners. It was funded by a consortium of banks — Citigroup, Deutsche Bank, Morgan Stanley, Credit Suisse, Royal Bank of Scotland and Wachovia. In a strange twist, THL and Bain ended up suing those six banks in March 2008 after they supposedly planned to back out of the agreement. When it seemed those court cases weren't going to be ruled in their favor, they all reached a settlement in May 2008. These bank loans take the form of long-term debt that can leave companies with little breathing room as the interest payments, and larger debt obligations, begin rolling in. The timing of iHeartMedia's buyout, which took place as the financial crisis was truly beginning, was poor. "So-called legacy media industries have faced fierce competition for advertising dollars from digital formats," writes Matthew Crain, an assistant professor of media studies at CUNY who examined private equity and media ownership shortly after the iHeartMedia buyout, in an email to NPR. "The great recession also hit advertising quite hard across the board." "As far back as 2006, our research showed that ownership consolidation led to loss of jobs, decreased format diversity, and diseconomies of scale that hurt the entire broadcasting business," writes Kevin Erickson of the Future of Music Coalition, a D.C.-based advocacy group, in an email to NPR. "It's no surprise that listeners will tune out and seek alternatives like digital platforms, as well as college & community radio, where they can hear a greater diversity of voices." "Before the buyout, Clear Channel held a good amount of debt from its 1990s merger spree and had already been hollowing out its stations' local identities by imposing efficiencies, like moving to popular cookie cutter formats and reducing live programming. Private equity accelerated these trends and added a mountain of new debt," Crain continued. Bob Pittman, chairman and CEO of iHeart, writes: "We have transformed a traditional broadcast radio company into a true 21st century multi-platform, data-driven, digitally-focused media and entertainment powerhouse."